He is unable to go to school due to his stoma bag. Donate for his surgery so that he can get rid of all his painful symptoms! 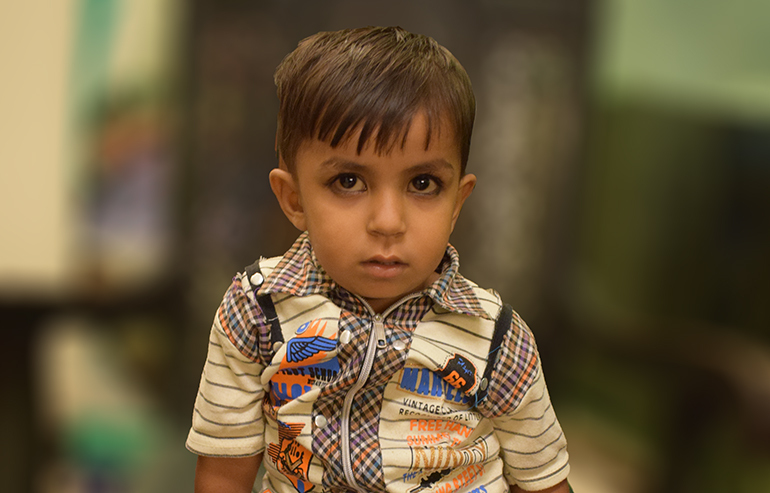 Muhammad Awais is a 3 years old boy who lives in a small house in Lahore with his parents and 4 siblings. Muhammad’s 3 sisters go to a local school. He too wants to study but his health is not allowing him to even go out and play. Muhammad Awais was diagnosed with Hirschsprung Disease when he was born. Hirschsprung’s disease is a condition that affects the large intestine (colon) and causes problems with passing stool. The condition is present at birth (congenital) as a result of missing nerve cells in the muscles of the baby’s colon. He was only 3 days old when he underwent his first surgery (colostomy) free of cost at a local hospital and a temporary opening was made on his abdomen for stool passage. Doctor recommended him to undergo another surgery but they never gave surgery time. Muhammad’s parents don’t have enough money to pay for the surgical expenses at any other hospital. He is suffering from severe symptoms these days including frequent fever, lose motions, abdominal pain and hygiene issues. He is unable to go anywhere or play due to his condition. In such circumstances, they came to know about Transparent Hands and they were relieved to know that their son’s surgery will now be performed free of cost. Muhammad Awais is now scheduled for his Duhamel surgery in a few days at Akram Medical Complex. His parents say, “we cannot see our child suffering everyday due to his disease. Please donate for his surgery”.